India has been scrapped from the 2014 calendar. Formula One Management (FOM) says it will be back in 2015, but there are fears it may never return. "If we can bring F1 back in 2015 then the miss of 2014 is not crucial. If we try to go beyond 2015, it will be very difficult to bring F1 back," President of the Federation of Motor Sports Clubs of India Vicky Chandhok says. Organizers blame scheduling changes and the depreciating rupee, which has fallen 40% against the dollar in the past two years, making one of the world's most expensive sporting events unsustainable. The uncertainty also comes amid declining local interest and following a petition being lodged with the Supreme Court to cancel the race, following claims that were denied by the organizers that taxes had not been paid from last year. The hearing has been pushed back to next week. One hundred thousand tickets were sold during India's debut grand prix in 2011. Organizers say they'd be lucky if they sold half of that now even though prices have been slashed to fill seats. "The first year there's always a buzz, in the second year we saw a declining trend and now in the third year you get a sense of the real picture," Chandhok says. With little mass appeal in cricket crazy India, critics wonder if bringing F1 to India was ever a good idea. But the lure of Formula One is never just about fast cars. "Remember Formula One is not sustainable anywhere, unless its part of a larger product. Here the idea is you're building a sports city, a cricket ground, apartments, expressways, it's part of a much larger project therefore it makes sense," Chandhok says. An entire township was built around the Buddh International circuit. The Indian construction giant and F1 promoter Jaypee Group invested $300 million on a state-of-the-art track. There is some concern when the Formula One circus leaves town next week, a very expensive white elephant will be left behind. However, the idea is not to make money off the race alone but the real estate around it. Sixteen-hundred apartments were sold just a few months ago. Still, Jaypee Group says the Indian government should contribute to ensure Formula One stays in India. "In 17 of the 19 F1 host countries, the governments support Formula 1, the tourism industry tries to promote it. In India that has unfortunately not happened," says Jaypee Group spokesman Askari Zaidi. Organizers say the government should consider the tourism and prestige Formula One can bring to a developing nation like India. "You've got five billion viewers per annum watching F1 (a figure backed up by industry insiders Formula One Money), and India is going to viewed through the eyes of a camera for two hours on Sunday and three hours on Saturday. That's plenty of eyeballs and PR time for the country." But first, Formula One will need to appeal to more Indians. The crowds may have diminished but the hopes for keeping Formula One in India have not. A country where hundreds of millions scrape for sufficient food to survive does not need to spend its meager resources on car racing. Then again, the very rich in India don't really care. Remember the monstrosity that Ambani built in Mumbai. this is the Indian GP, you are talking about the American GP I guess! Common!, In India there is no such poverty now.. Majority of people could easily afford the best of pleasures of western world now. This India is different from India of 80's, and even in developed countries people scrape for food. Most of India is better off than the poverty we see in detroit and other such cities. CNN has this wrong. You write about only one side of the story and leave a huge chunk out. Basically, Formula One doesn’t want to continue in India because of Indian government greed and bureaucracy. Had you interviewed members of the sport – or just kept up with the sport – you would know this. 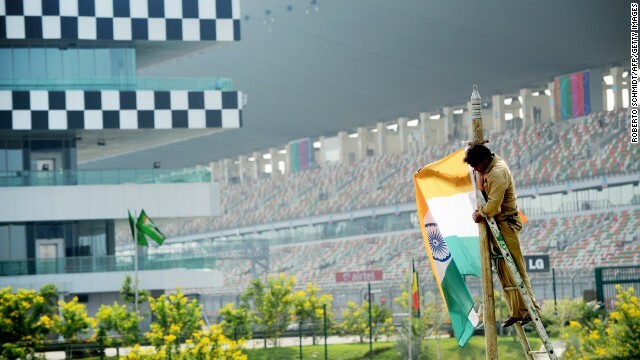 Example: The government of Uttar Pradesh has asked the courts to withdraw its entertainment tax exemption on the Indian Grand Prix organizer Jaypee Sports International. The decision would cost Jaypee around $5 million. Also, F1 teams and organisers, not to mention the media, are made to jump through bureaucratic hoops to visit the country. Dumping the 2014 race was met with much cheering in the paddock and it is unlikely that the country will get another race unless its bureaucrats understand how such things work. Your emphasis on the number of fans and benefits to the local economy show a complete ignorance of how professional sports work. Income from attendance is miniscule compared to TV revenues. Formula 1 is not really a sport for the masses... Most people do not spend their childhood racing cars after school or on weekends. Their only experience of it is through video games. And F1 is nowhere as flashy as a car racing game. When there are local players, there might be some interest in an otherwise alien sport. But not many people are going to learn about the tire-changing rules or the drag reduction system or the weight limits and other technical aspects, especially when they didn't grow up with the sport. It's too bothersome a sport with too little reward for the average person to follow. Come to the UK you will be surprised how many people do spend they off time racing cars in one form or another. Yeas, England the country that gave us Tennis, football, badminton and excels in none of them. Then they had Lewis Hamilton.. but now he's fizzed out. Actually lost my train of thought here.. Hooray for machines on 4 wheels going round and round very fast.. again and again and again! ... 5 billion viewers a year... you're right, not a sport for the masses. Keep up your assessment of the world around you. Looks like it's working for you so far. HamiltonFan. A sport for the masses in this context means that the majority of the people of that particular country is not really that interested in motorsport racing. He/she is not referring to the global audience. I can bet ur from pakistan... can smell the smoke....lolz.. The hoardings are up. The pavement lines are freshly painted. The hundreds of impoverished ghetto inhabitants are cleverly hidden. And the dozens of wealthy fans who think F1 is a variation of FU, and that Vettel is a computer race game, and know squat about this boring event,will watch perhaps 3.7 minutes and pass out due to anaphylactic reactions to the boredom of Formula 1. This has nothing to do with the Indian population of the popularity of F1 in India. International sporting events held in India are always subject to the tiring bureaucratic system that is primarily designed to pay off politicians and local power brokers. The reason F1 is leaving India is because the economics did not work for all parties. Specifically, the teams, F1 governing body, and the local and international sponsors were not willing to pay the price because they have plenty of other options. Somehow the Indian system and its idiotic politicians do not understand this. interesting thoughts from the f1 owners "f1 is unsustainable everywhere unless it belongs to a wider project" ... yes, it fits excellently into a mass-construction-corruption project. Politicians nowadays are always looking for instant gratification. Nowhere you are going to get a well thought long term project. Look at Valencia spain, for example. F1 circuit built with thousands of millions from taxpayers money, against the will of the whoke city but their corrupt politicians, now is a finer example of urban decay than Detroit. They dont care, the kickbacks and hand-assignment of construction project already happened, nw is time ti wsh hands and blame the crisis. Look at Bahrain... the shiny new circuit built ex-profeso for the championship contrasted with the near-civil war outside of its perimeter. And it was all business, it was just pathetic listening to the promoters saying more or less that nothing was going on, and that human rights were not their task. Its a fact, the World requires the Indian market which is growing with an increasing population of people as well as millionaires.Fast expensive cars and motorcycles are the rage among India's elite class of billionaires and millionaires.At least ":MOTO GP' would be popular when introduced at the "BUDDH CIRCUIT" although ticket sales of "India Grand Prix" seem disastrous.I personally feel that the "INDIAN GRAND PRIX" will return to India since the future of mass sports is in India although critics would scoff at the inequality of wealth poverty ratio. Isn't there poverty in "First world Country's" although at a different level compared to India ? The "RICH' and "POOR" divide is eternal and cyclical.Where are the "Indian Maharajahs" of pre-Independence India in 2013 and who has substituted their wealth ?Although i don't own a car nor ever have the intention of owning one being a total "2-Wheeler freak" i am for the "INDIAN GRAND PRIX" being a regular fixture on the Indian sporting calender. people in india do not make enough money to sustain a richmans sport. dugh. people in india are looking for HI, not F1 – please get that right. F1 as a tourist attraction in India? I mean when you compare Chinese GP to Indian GP, the difference is HUGE. Even if China overall is not a super-clean country the areas around the GP venue is clean. People are not going to stay for days on end if a place is not clean... no one wants to get sick from vacations. Wow. "Uncertain Future?" It's dead. A one-year hiatus and come back? Only the classic European tracks have the ability to do that because they are exciting, excellent tracks. The recent spate of "Tilkedromes" are boring, and as long as someone else is willing to pay Bernie money, there will be other races. Mexico is looking good for 2015 or 16.